The Broadhurst Theatre is a Broadway theatre located at 235 West 44th Street in Midtown Manhattan. It was named after George Howells Broadhurst, an Anglo-American dramatist who came to America in 1886. 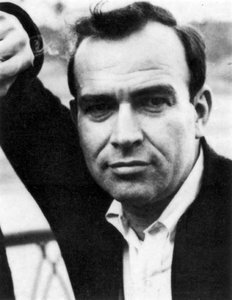 In addition to writing plays, he managed theaters in Milwaukee, Baltimore, and San Francisco before he decided to open his own in association with the Shubert brothers. The theatre was constructed to house both musicals and plays, which it has done successfully for more than a century. It has been designated a New York City landmark. The Broadhurst opened on September 27, 1917 with George Bernard Shaw's Misalliance, the first New York production of the philosophical 1910 comedy. It ran for only 52 performances and was not performed on Broadway again until 1953. Recent tenants include Les Misérables, which in October 2006 began an intended six-month-long return engagement that finally closed in January 2008; and 2008 revivals of Cat on a Hot Tin Roof, with an all-African American cast including Terrence Howard, Anika Noni Rose, James Earl Jones, and Phylicia Rashad, and Equus, starring Daniel Radcliffe and Richard Griffiths. The theatre is also notable for hosting Jerry Seinfeld's final performance of his original stand up material, which was filmed for an HBO special shortly after the finale of his long-running sitcom. Interior Panorama of Broadhurst Theatre. View from stage right, Box C.
1918: The George and Ira Gershwin composition "The Real American Folk Song" is included in Ladies First, the first time one of their co-written tunes is heard on the Great White Way. 1919: Jane Cowl writes and stars in her popular romantic drama Smilin' Through. 175 performances. 1924: Dixie to Broadway, starring Florence Mills, is the first all-Black show to have a mainstream Broadway production. 1924: Beggar on Horseback, a George S. Kaufman-Marc Connelly collaboration, stars Roland Young. 1928: The Ray Henderson-Buddy De Sylva-Lew Brown musical Hold Everything! introduces the public to "You're the Cream in My Coffee." 1929: June Moon, a comedy by George S. Kaufman and Ring Lardner. 1932: Leslie Howard produces and stars in Philip Barry's The Animal Kingdom opposite Ilka Chase. 1933: Sidney Kingsley's Men in White stars Luther Adler and Morris Carnovsky and ultimately wins the Pulitzer Prize for Drama. 1935: Helen Hayes and Vincent Price enjoy a 517-performance run in Victoria Regina. The Streets of Paris, premiered on June 19, 1939, at the Broadhurst Theatre, featuring Carmen Miranda to the American public. 1939: Carmen Miranda, Brazilian singer made her debut on the American stages in The Streets of Paris. 1944: Agatha Christie arrives on Broadway with Ten Little Indians. 1945: Follow the Girls completed its 888-performance run at the Broadhurst. 1946: Anita Loos' comedy hit, Happy Birthday, wins star Helen Hayes the first Tony Award for Best Actress in a Play. 1951: Barbara Cook makes her Broadway debut in the short-lived Flahooley. 1951: Seventeen, a musical, opens. 1952: Pal Joey revival runs for 540 performances and wins Tony Award for Helen Gallagher. 1956: Rosalind Russell has the title role in Jerome Lawrence and Robert E. Lee's Auntie Mame. 1958: France Nuyen and William Shatner co-star in Paul Osborn's The World of Suzie Wong. 1959: Fiorello!, with a Jerry Bock-Sheldon Harnick score, is directed by George Abbott, stars Tom Bosley, and wins a Tony and the Pulitzer. 1963: 110 in the Shade enjoys a 330-performance run with Robert Horton, Will Geer, Lesley Ann Warren, and Inga Swenson in her Broadway debut. 1964: Oh, What a Lovely War! garners 4 Tony Award nominations, including Best Musical, and wins the Theatre World Award. 1965: Kelly - The biggest Broadway flop, it closed on the opening night. 1966: Jill Haworth, Joel Grey, Jack Gilford, Lotte Lenya, and Bert Convy invite audiences to come to John Kander and Fred Ebb's Cabaret 1,165 times. 1967: More Stately Mansions, one of Eugene O'Neill's lesser efforts, has an all-star cast including Ingrid Bergman, Arthur Hill, and Colleen Dewhurst. 1969: Woody Allen, Tony Roberts, and Diane Keaton forsake the screen to star in Allen's Play It Again, Sam; The Fig Leaves Are Falling closes after only four performances. 1970: Cry for Us All, a musical adaptation of the hit off-Broadway play Hogan's Goat, was far less successful than its source, closing after only eighteen previews and nine performances. 1971: 70, Girls, 70 was an unsuccessful collaboration by Kander and Ebb. 1974: Marlo Thomas makes her Broadway debut in Herb Gardner's Thieves, directed by Charles Grodin. 1976: Katharine Hepburn and Christopher Reeve co-star in Enid Bagnold's drama A Matter of Gravity. 1976: Larry Gelbart's Sly Fox, directed by Arthur Penn, stars George C. Scott, Jack Gilford, Gretchen Wyler, and Hector Elizondo. 1978: Ann Reinking and Wayne Cilento star in director and choreographer Bob Fosse's Dancin'. 1980: Peter Shaffer's Amadeus, with Ian McKellen, Tim Curry, and Jane Seymour, settles in for a 1181-performance run. 1983: Alfonso Ribeiro plays the title role in The Tap Dance Kid with Hinton Battle, who wins a Tony. 1984: Dustin Hoffman is Willy Loman in Arthur Miller's Death of a Salesman. 1986: Neil Simon's Broadway Bound, co-starring Jason Alexander and Phyllis Newman; Linda Lavin wins a Tony for her performance. 1990: Aspects of Love proves to be one of Andrew Lloyd Webber's least successful shows. 1993: The Terrence McNally-John Kander-Fred Ebb musical Kiss of the Spider Woman stars Chita Rivera, Brent Carver, and Anthony Crivello. 1996: Sarah Jessica Parker stars in a revival of the musical Once Upon a Mattress. 1998: Jerry Seinfeld delivered his final performance of his original stand-up act, I'm Telling You for the Last Time. 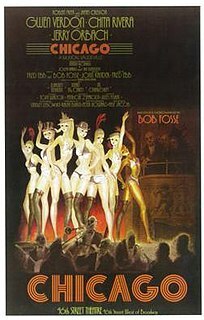 1999: Fosse, a revue featuring Bob Fosse shows. 2001: Ian McKellen and Helen Mirren starred in a revival of August Strindberg's Dance Of Death. 2002: A revival of Stephen Sondheim's Into the Woods, with Vanessa Williams as the Witch. 2003: A musical adaptation of the film Urban Cowboy. 2005: Lennon, featuring the former Beatle's music and lyrics, runs for 42 previews and 49 performances. 2006: Alan Bennett's The History Boys transfers from London with its cast intact. 2006-2008: The revival of Les Misérables to celebrate the show becoming the longest running musical in the world. 2008: A revival of Equus stars Daniel Radcliffe and Richard Griffiths. 2009: A production of Friedrich Schiller's Mary Stuart stars Janet McTeer as Mary, Queen of Scots, and Harriet Walter as Elizabeth of England. 2010: ENRON, a play by Lucy Prebble, inspired by the infamous 2001 financial scandal involving the company. 2010: Public Theater's transfer of The Merchant of Venice, starring Al Pacino as Shylock. 2011: Floyd Mutrux's Baby It's You!, starring Beth Leavel. 2011: Hugh Jackman, Back on Broadway, starring Hugh Jackman. 2012: A Streetcar Named Desire, starring Blair Underwood and Nicole Ari Parker. 2013: Lucky Guy, starring Tom Hanks. 2013: Mamma Mia!, transfer from the Winter Garden Theatre. 2015: Misery, starring Bruce Willis and Laurie Metcalf. 2016: Tuck Everlasting, a musical based on the 1975 book by author Natalie Babbitt; starring Andrew Keenan-Bolger, Carolee Carmello, Michael Park, Terrence Mann and introducing Sarah Charles Lewis. ^ a b "Broadhurst Theatre (Broadway)". Playbill. Wikimedia Commons has media related to Broadhurst Theatre. 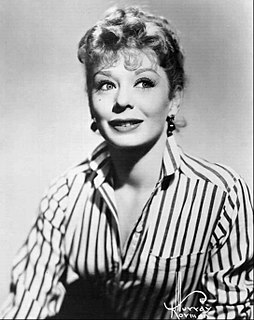 Gwyneth Evelyn "Gwen" Verdon was an American actress and dancer. She won four Tony Awards for her musical comedy performances, and served as an uncredited choreographer's assistant and specialty dance coach for theater and film. With flaming red hair and a quaver in her voice, Verdon was a critically acclaimed performer on Broadway in the 1950s, 1960s, and 1970s. Having originated many roles in musicals she is also strongly identified with her second husband, director–choreographer Bob Fosse, remembered as the dancer–collaborator–muse for whom he choreographed much of his work and as the guardian of his legacy after his death. John Harold Kander is the American composer of a number of musicals as part of the songwriting team of Kander and Ebb. His best-known stage musicals as composer are Cabaret and Chicago, both of which were later adapted into films. Chicago is an American musical with music by John Kander, lyrics by Fred Ebb, and book by Ebb and Bob Fosse. Set in Jazz-age Chicago, the musical is based on a 1926 play of the same name by reporter Maurine Dallas Watkins about actual criminals and crimes she reported on. The story is a satire on corruption in the administration of criminal justice and the concept of the "celebrity criminal". 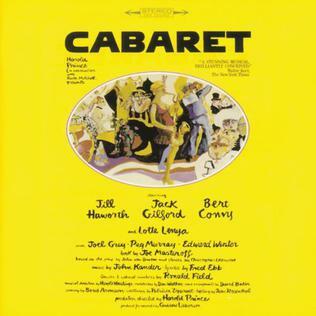 Cabaret is a 1966 musical with music by John Kander, lyrics by Fred Ebb, and book by Joe Masteroff, based on John Van Druten's 1951 play I Am a Camera, which was adapted from the short novel Goodbye to Berlin (1939) by Christopher Isherwood. Set in 1931 Berlin as the Nazis are rising to power, it focuses on the nightlife at the seedy Kit Kat Klub, and revolves around American writer Cliff Bradshaw and his relationship with English cabaret performer Sally Bowles. Flora the Red Menace is a musical with a book by George Abbott and Robert Russell, music by John Kander, and lyrics by Fred Ebb. The original 1965 production starred Liza Minnelli in the title role in her Broadway debut, for which she won a Tony Award for Best Actress in a Musical. This was the first collaboration between Kander and Ebb, who later wrote Broadway and Hollywood hits such as Cabaret and Chicago. Donna McKechnie is an American musical theater dancer, singer, actress, and choreographer. She is known for her professional and personal relationship with choreographer Michael Bennett, with whom she collaborated on her most noted role, the character of Cassie in the musical A Chorus Line. She earned the Tony Award for Best Actress in a Musical for this performance in 1976. She is also known for playing Amanda Harris/Olivia Corey on the Gothic soap opera, Dark Shadows from 1969 to 1970. Susan P. Stroman is an American theatre director, choreographer, film director and performer. She is a five-time Tony Award winner, four for Best Choreography and one as Best Director of a Musical for The Producers. In 2005, she directed the film version of The Producers. Irene is a musical with a book by James Montgomery, lyrics by Joseph McCarthy, and music by Harry Tierney. Based on Montgomery's play Irene O'Dare, it is set in New York City's Upper West Side and focuses on immigrant shop assistant Irene O'Dare, who is introduced to Long Island's high society when she is hired by one of its leading grande dames to help redecorate her home. The Act is a musical with a book by George Furth, lyrics by Fred Ebb, and music by John Kander. Beth Leavel is an American stage and screen actress and singer. Dancin' is a musical revue first produced in 1978, directed and choreographed by Bob Fosse, who won a Tony Award for the choreography. The show is a tribute to the art of dance, and the music is a collection of mostly American songs, many with a dance theme, from a wide variety of styles, from operetta to jazz to classical to marches to pop. 70, Girls, 70 is a musical with a book by Fred Ebb and Norman L. Martin adapted by Joe Masteroff, lyrics by Ebb, and music by John Kander. 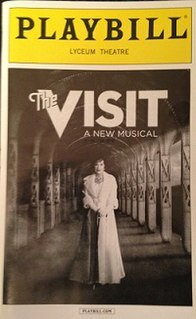 The Visit is a musical with a book by Terrence McNally, lyrics by Fred Ebb, and music by John Kander.